Guess one could say Tyler Flanagan’s debut as Woodland’s quarterback was a success. After all, he was responsible for six touchdowns. Flanagan is more than just a running quarterback. He is a super athlete who is fast enough to run by opponents, agile enough to make opponents miss him, and tough enough to just run over an opponent, or two or three. 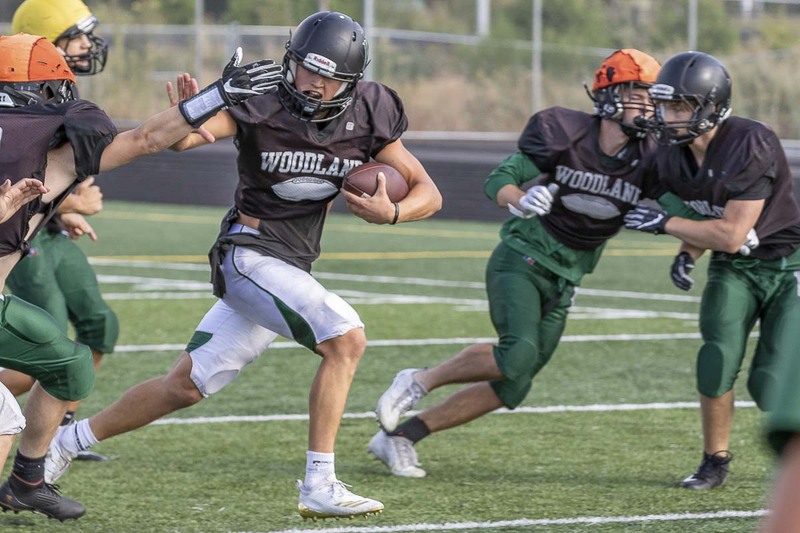 All of those skills were on display in Woodland’s 48-40 win over Kalama. I’ll just assume he meant that figuratively. In all, according to the TDN.com, Flanagan rushed for 257 yards and four touchdowns, plus he threw for two scores. The Beavers also got a defensive touchdown in this game. Isaac Hall had a pick-six to open the 2018 scoring. Woodland led 41-14 at the half, then had to hold off Kalama in the second half. He said he had never been part of a game like that, up four touchdowns after the first quarter but then having to hold off the opponent. “That’s a credit to their team, too,” he said, adding Kalama was a big test for the Beavers. While it got closer than a coach would prefer after such a big lead, Woodward said he was pleased with the character of his players. Besides Flanagan, Woodward pointed out the play of linemen Bryce Graham and Jason Bowman.